Paintball has become a regular outdoor activity over the past few years, here in Russia. But in some cases it is a real sport, and not merely a walk in the woods. Every boy's dream of playing soldiers and shooting enemies for fun – without serious consequences – of course, has come true in the form of "paintball". The discipline involves teams competing with each other to shoot their opponents. They use a gun-like device called a marker, which has pellets containing paint. There are different kinds of paintball, but as a sport, paintball was first played at the beginning of the 1980s in the US. “For me it's a mixture of everything – hobby, sport and fun. More games, more paintballs, means more fun. It's an extremely interesting pastime. However I started with it as a sport, and that kind of paintball is more professional than just for fun,” Vasily Panteleev, Russian Legion paintball team member, said. 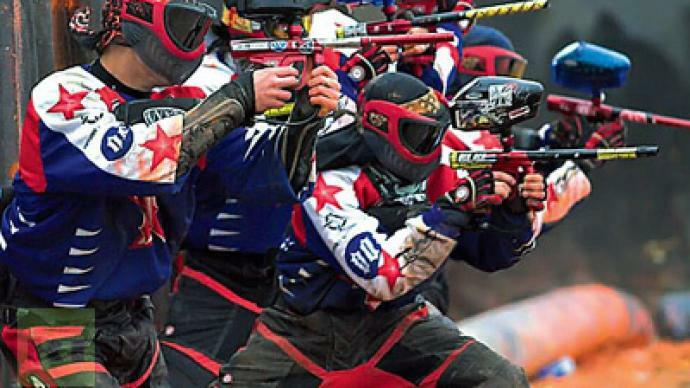 It is not surprising the Americans became the trend-setters with a big industry and the best league – almost like the NBA – for paintball players. And all the sport's fans gear up, once a year, for what has become the greatest and most anticipated paintball event – The PSP World Cup in Orlando. Teams from all over the world come to outshine their rivals and prove that they belong at the top. Most of them are from North America as the level of their performance is much higher, except for one team – the Russian Legion. This is a professional paintball team from Moscow that set themselves the aim of becoming World Number One back in 1996, and were crowned World Champions for the third time this year. The Russians continued to make history by thrashing all their opponents. As a result, in the final it was a paint massacre, with the Russian Legion side winning it seven-nothing.“The truth is that the best league with the best players is in the US where paintball is very popular. We are delighted to beat them all on their home ground but, of course, we would like to have a strong league here in Russia. And I hope the sport will grow to be popular and lots of youngsters will get involved,” Maksim Preobrazhensky, Russian Legion head coach, said. And, if the Russian Legion team continue their winning ways, they could well achieve their aims of making paintball even more popular here in their native land.